Pyrrolizidine alkaloids (PAs) occur in many different plant families, for example the composites (Asteraceae) and the species-rich and economically important legumes (Fabaceae). The main PA-producing genus of the legumes is Crotalaria, which is found in the tropics and subtropics. There are some specialised insects feeding on these toxic plants without being poisoned. The insects can even use the toxic metabolites of the plants for the production of pheromones or for the protection of eggs against other animals. 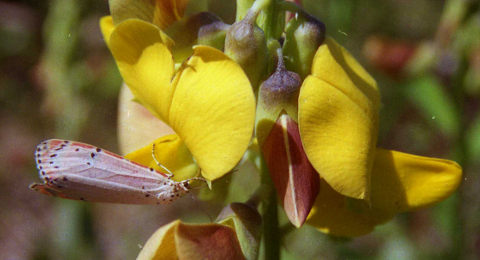 However, in our working group we are interested in another aspect of Crotalaria: We found that the plants need the presence of symbiotic soil bacteria, the so-called rhizobia, for the production of toxic alkaloids. The rhizobia induce the development of specific root organs, the nodules, which are symbiotic structures found almost exclusively in the legume family. During the development of nodules the rhizobia are transported to the inner nodule tissues, where they can fix nitrogen for the plants use. The dependency of PAs on this plant-bacteria interaction involves three domains of life: The PA-producing plants, the specialised insects and the soil bacteria, which trigger the PA production in Crotalaria. It is still unknown, how the PA production of Crotalaria is coupled with the symbiosis between the plant and the nitrogen-fixing bacteria. First results of our research show that it is not the availability of nitrogen triggering the production of nitrogen-containing alkaloids in the plant. There have to be other factors involved in this plant-bacteria system with an impact on the plants protection against herbivores. Thus, the focus of our research lies on the understanding of the molecular mechanisms and the evolution of this link between plant-bacteria interaction and alkaloid biosynthesis.